Authentic white stone house located on a hill in the small village of Mauroux overlooking a lake. You will be charmed by the soothing landscape of the fields and the lake. Immersed in the countryside of Gers you can relax and enjoy the gastronomy and culture of the region. The cottage is composed of a central corridor serving a large kitchen where sits a large rustic stone fireplace (with stove for winter), a cozy living room with two sofas including a sofa, two bedrooms, a bathroom with Italian shower and bathtub, and a toilet. The house is also equipped with a crib, a high chair, a changing table and a small bath. On the garden side you will have a large table, a parasol and a charcoal barbecue. A swimming pool (4m / 6m, 1. 2 meter deep), surrounded by a large wooden terrace, is at your disposal. It is private and is linked to the cottage. The cottage is located in a hamlet of 3 houses, one is also for seasonal rental. In high season rentals are from Saturday to Saturday. Amazing place to stay, the children (4&7) loved the pool. We had the most wonderful week. You needed a car for the short journey to the nearest restaurants but it was worth it for the views and tranquility. The pool and decking were great. Most days were spent by the pool and evenings barbecuing and enjoying a glass of wine. We explored the local areas but it was hard to tear the girls away from the pool! The house was immaculate, we could t fault it. We would love to return! The neighbours dog is very friendly (our girls loved playing with him and still talk about him a year later). Do not throw the sticks for him if you don’t want his regular attention. Wonderful holiday!! 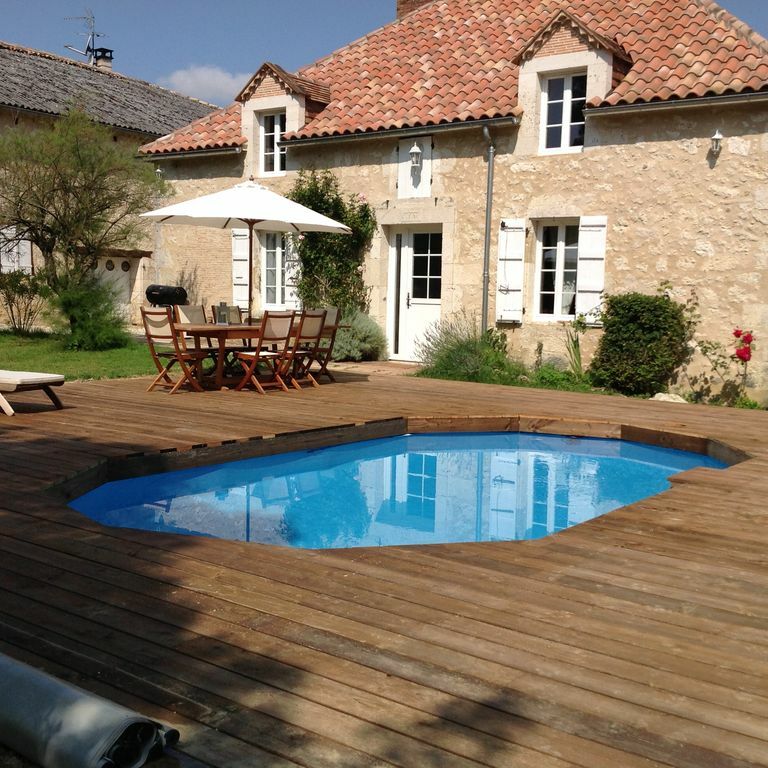 We have just left this idyllic location, the gite, the pool, the location are all gorgeous. It really is out in the countryside, if you’re looking for peace and quiet this is the place for you. The views are particularly stunning. Julien was a lovely host, extremely approachable. We have thoroughly enjoyed our stay at En Piquet. We had a lovely time. The house is beautifully situated with wonderful views. Pool was great. One of our highlights of the holiday was the dog who we completely fell in love with. A tip if you’re not a dog lover, don’t throw his stick! We had a great time and would happily visit again. What wonderful treat from start to finish! Booked this beautiful farm house for 6 of us as we had a wedding to attend nearby. A simply wonderful stay and Julien the most attentive and kind host. The rooms were spacious and airy with all the amenities needed. The outside pool and decking area was perfect and we had a wonderful time relaxing either in the sun or under the stars! Hemos disfrutado mucho tanto de la casa como del entorno. La casa muy bonita, confortable y acogedora. Ha hecho buen tiempo y hemos disfrutado tambien de la piscina. Cadre idyllique au milieu d'une campagne vallonée et ravissante. Nous venons d'y passer une semaine avec nos enfants. Maison soignée et bien équipée, literie impeccable, propriétaire attentif et discret, région à découvrir,... Rien à redire. Vous passerez un agréable séjour dans cette maison / région. Une caution de 500 euros vous sera demandée à votre arrivée plus le montant de la taxe de sejour ,sur un cheque différent ,correspondant au calcul suivant : X personne( de plus de 18 ans) x Nb de nuitee x 0,45 euros .